As a former preschool teacher. . . . I know that sensory/art experiences for kids are important. It was easy with Norah to paint – I only had to clean up one kid. No big deal. Adding Lucy into the mix made things a little trickier, but I still made the effort regularly. Then Daphne came along. Wow. The thought of getting the paints out now is overwhelming. Norah and Lucy paint frequently . . .when Daphne is resting, but I am pretty sure that at almost 3, Daphne had never painted before. Oh, wait, there was the one time when someone drove through our fence and Kevin put up a piece of plywood so the kids could still play outside safely – we let the kids paint the plywood. I saw this cute idea and knew this would be the perfect project for Daphne. I loved it because the first step was to paint a 18×12 sheet of paper with fall colors. The only goal was to cover the whole page with paint – didn’t matter what it looked like. I thought the best method with the least amount of mess would be to strip her down. Daphne was not a fan of this – but as soon as I handed her the paintbrush, she was over it! 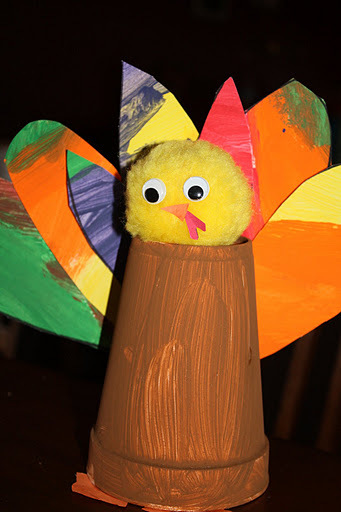 This entry was posted in Art, Daphne, Homeschooling, Thanksgiving. Bookmark the permalink. ← She Did It. . . Again!